13 enthusiastic participants presented at Muker, ranging in age from 19 to ....well perhaps some things are best left unsaid! There was some lingering low cloud at 10am and a light spray in the air, but the forecast was optimistic. Setting off, we zig-zagged steeply up Kisdon Hill and, as the terrain levelled out, sure enough the the cloud began to lift revealing the spectacle of upper Swaledale. The mandatory coffee stop was insisted upon at 11.00 (thanks for keeping me right Carol). Fortuitously, the pause allowed for first aid to be administered to one of our number who had tripped on a metal drainage channel transecting the path. Happily, expertise was on hand and Fell Rescue was not required! A brief pause was taken in Keld to peruse a recently opened exhibition, detailing some of the history of the area. East Gill falls, a popular picnic spot, then provided an impressive photo opportunity. The next familiar landmark encountered, was the rusting hulk of an ancient Massey Ferguson tractor; it was there 30 years ago when I first walked this route, and will likely be continuing with it's steady demise in another 30! Bypassing Crackpot Hall and negotiating a recent landslide, it was not long before lunch was taken in Swinner Gill. The final stretch took us high across Arn Gill Scar. The path required focused concentration and, whilst uneven, undulating and narrow in places, afforded commanding views along the valley. 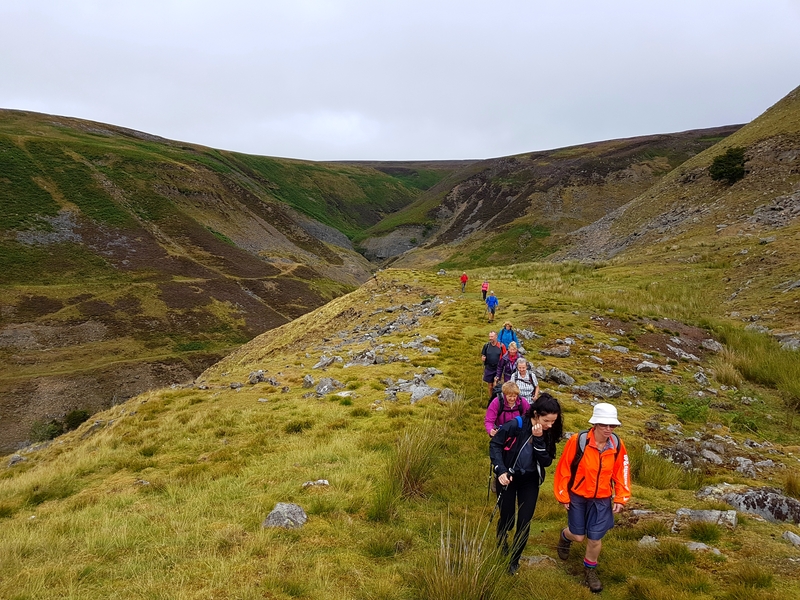 It culminated in a challenging 'reverse scramble' and traverse of more landslip at Arn Gill; possiby the highlight or low point of the walk, depending on your point of view! Shortly after we were enjoying the grassy, tree lined descent through Ivelet Wood and the pleasant saunter through meadows to Muker village. The day was agreably rounded off with refreshments and reflection, care of the Muker gallery. A very pleasant walk in great company.